St. Michael’s is a modest sized suburban church built in 1956 to replace the original church which was bombed in 1944. The churchmanship is firmly in the Anglo-Catholic tradition. 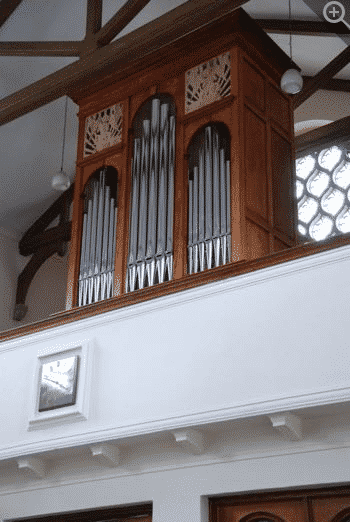 The very uninspiring old organ was in a very bad state by 2011, and the organist, Alan Burtonshaw very generously donated the funds to purchase a new organ. He was keen that the organ would be based on the instrument we had built a few years before at St. Giles, Cripplegate. As St. Michael’s church is smaller than St. Giles, the pipe scales of the new organ were reduced slightly, but the specification is identical. The case was also of a more modest design, picking up elements of the Italianate features of the church. The organ has the benefit of being ideally placed on the west gallery of the church (which is also where the choir is also placed) a very unusual arrangement for an Anglican church! The organ has entirely mechanical key and drawstop action. View the Specification of St Michael's (completed early 2012) and the pipe scales.